Click here for the HYLA application form! We are pleased to invite you and your friends to the 2018 Hudson Youth Leadership Academy, or HYLA as we like to say. 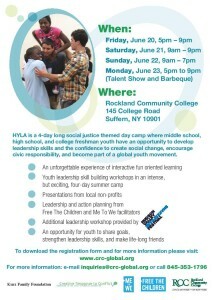 HYLA will offer leadership skill building workshops in an intense, but exciting four day conference. This is an opportunity for you to share your goals, strengthen your skills, and make life-long friends. Young people (like you) today have so much to offer as the leaders of tomorrow. With this view and our passion to see young people empowered, the Kurz Family Foundation initiated collaboration between Creative Response to Conflict (CRC), Me to We, Free the Children and Rockland Community College (RCC). This registration package has everything you need to apply to HYLA. To register, please complete the form (in the link at the top of the page) and mail it to the address below. Participants should arrive no later than 9 AM. at the entrance to the Cultural Arts Center. A HYLA team member will meet participants in the upper level of the Center. 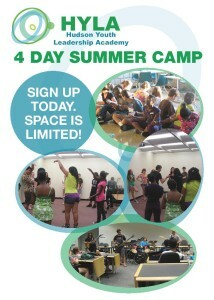 Application deadline with deposit is due June 1. In order for an application to be considered complete, a non-refundable deposit of $30 is expected at the time of application. The balance is due June 7. Please invite your friends, family, and colleagues. PLACE: Rick’s Club American, 100 Lake Road, Congers, NY,10920. Don’t forget to tell your friends, family, and colleagues. We have started a Crowdrise Fundraiser to raise funds for a brand new Bullying Prevention and Intervention tool to use in schools and youth-centered organizations. The new tool will be a film called the BullyProof Movie. The film will feature the animal characters and their assorted BullyProof characteristics. There is a second portion of the film that will demonstrate in a group setting how to utilize the puppets in role-play activities that teach how to confront bullying by putting on one’s BullyProof Shield. The purpose of this section of the film is to give teachers and other community leaders ideas of how to utilize the puppets within their environments. – For more information about the BullyProof Movie and the fundraiser for it, please visit Crowdrise: http://www.crowdrise.com/bullyproof! “perhaps the country’s most outspoken critic of education’s fixation on grades and test scores”. SUNY New Paltz’s Humanistic/Multicultural Education program invites you to join Alfie Kohn in a conversation about common core and standardized tests. His thoughts and work in this area may lead us all, teachers, parents and school administrators, to some creative problem solving regarding the subject. Thursday, April 25, 2013 at 4:30 p.m.
Kohn has written books on the subject: No Contest: The Case Against Competition, Punished By Rewards and most recently, Feel-Bad Education. The talk is sponsored by the Humanistic/Multicultural Education Program; CAS; Departments of Elementary Education, Secondary Education; Educational Studies; and Sociology; Progessive Academic Network; Re-thinking Testing; New Paltz Chapter of Phi Delta Kappa; and Hudson Valley Writing Project. For more information about the event, contact: Nancy Schniedewind, 845-257-3200 x2827, schnieden@newpaltz.edu and for more information about Alfie Kohn go to: alfiekohn.org/index.php. This year’s theme is: Creating A Culture of Caring In Our Schools! 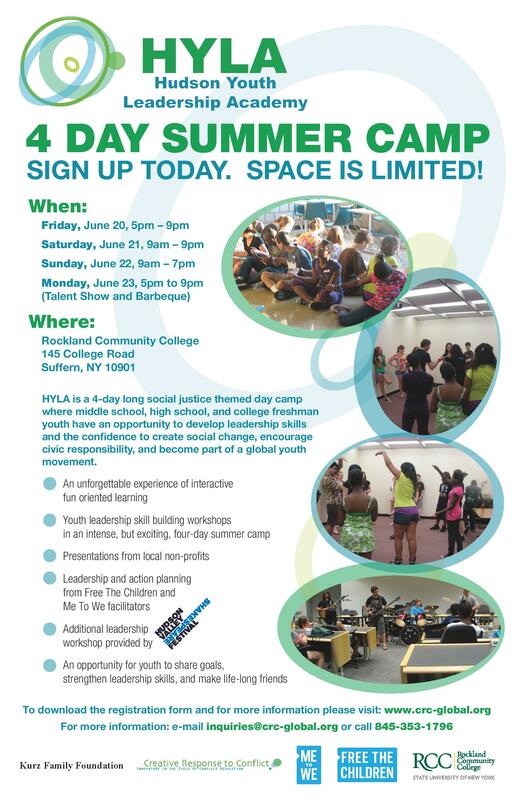 The Hudson Youth Leadership Academy (HYLA) is a four-day long camp, designed to give middle school, high school and college freshmen youth the leadership skills and confidence they need to create change within their community. Re-Entry supports 1 Billion Rising! 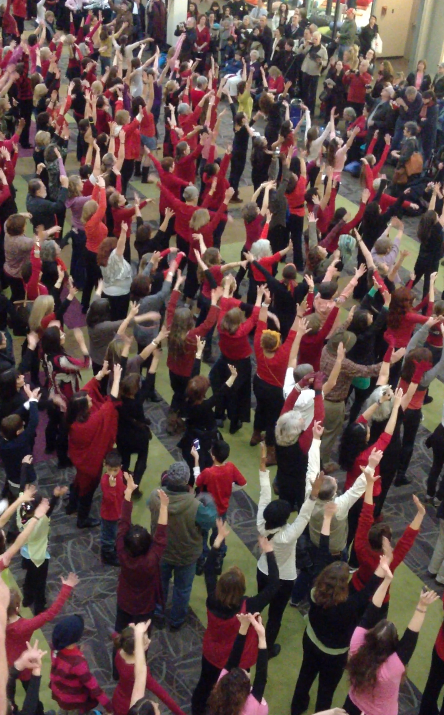 Last Thursday, February the 14th, One Billion women danced and rose to end violence against women! This movement was started by OneBilionRising, an organization founded to make an end to the atrocity, that one of three women will be raped or beaten in her lifetime. 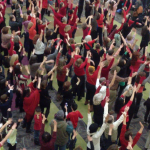 Proud to be part of these one billion women (and those who love them), the women of CRC’s Re-Entry Support Program met at the Palisades Mall, West Nyack and participated in the dance, with happened across the globe on the same day. Have a look and enjoy watching One Billion Women (and those who love them) rising to end violence against women. Each year, the German Peace Organization Eirene sends out volunteers who want to help in Organizations all over the world. Since the last three years, CRC was glad to welcome the volunteers Christopher Ohnesorg, Malte Greiner-Petter and Johannes Glatz from Germany to work with Creative Response to Conflict. In their Newsletter they always feature articles about the work their volunteers do, all around the globe. This time, it’s an article about Johannes Glatz and his work for Creative Response to Conflict. The Original article is in German, but we are also providing an English version of the article. To read the English translation, please click here. To read the original German article, please click here.